ITEN Wired is the Gulf Coast’s premier event to connect, collaborate and build community with industry leaders, entrepreneurs and educators in technology. Join us October 2-4, 2019 on beautiful Pensacola Beach, Florida. We’re a community of leaders, innovators, and academics who come together to exchange ideas and forge new collaborations around innovation, technology, and entrepreneurship. Our focus is on cybersecurity, information technology, start-up tech, artificial intelligence, robotics, and emerging technologies. While we highlight the Gulf Coast tech and entrepreneurial community, we also explore and highlight emerging technology and innovators on the national scene. Gather insights. Exchange ideas. Grow relationships. This event is for those leading their industries and changing technology for the better to unite and to renew their commitment to creating change every day. From the main stage to breakout sessions, you’ll learn from a diverse group of tech leaders and entrepreneurs who’ll share captivating, inspiring stories and plenty of behind-the-scenes, practical advice. The best learning comes from experts who have been-there-done-that. Our small group workshops will give you the practical tips and tactics you need to implement and apply to your job or project. No conference would be complete without downtime to meet and mingle. Our networking events allow attendees plenty of time to connect and engage in a fun and festive atmosphere along the beautiful white sands of Pensacola Beach. 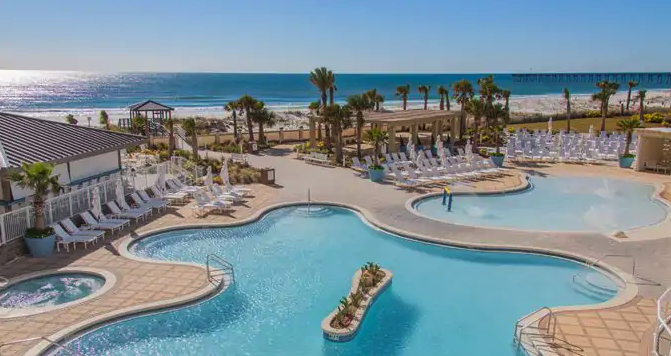 Hilton Pensacola Beach overlooking the stunning emerald waters of the Gulf of Mexico, just steps from water sports, shopping, dining and entertainment. Blue skies, sugar white sands and emerald waters. There’s a reason why ITENWIRED is held on beautiful Pensacola Beach, recently named #5 on TripAdvisor’s Top 25 U.S. Beaches.